GALAX is a relatively well-known name in the world of video cards because the company offers a lot of non-reference graphics based on NVIDIA GeForce GPUs. In the recent years, Palit Microsystems, the parent company of GALAX and one of the largest makers of graphics cards, decided to expand GALAX’s business with SSDs and memory modules. 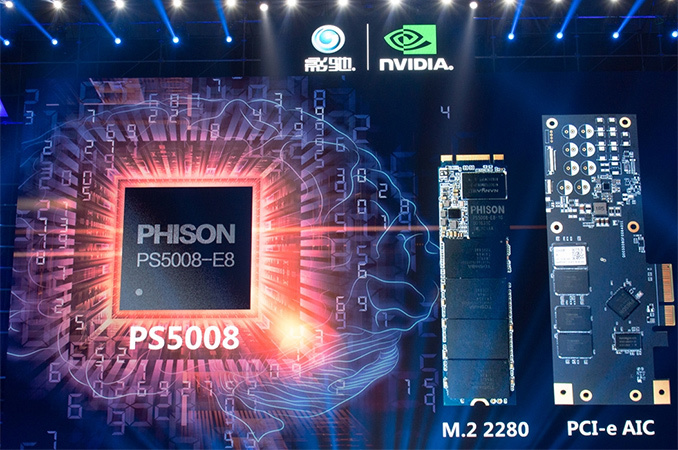 At an event in China this past week, GALAX demonstrated/announced one of the industry’s first SSDs based on Phison’s PS50008-E8 controller. Just like many other newcomers, GALAX does not develop its SSDs itself, but buys turnkey platforms from other makers, such as Phison, which sells controllers along with memory and firmware. At present, GALAX lists three 120 – 240 GB MLC NAND-based SATA drives on its website: one SSD is powered by the Phison PS3109-S9 controller, another drive featuring the PS3110-S10 as well as the third model that uses a controller by JMicron. The contemporary drives from GALAX target entry-level PCs, but in the coming months, the company plans to expand its SSD lineup with at least two more advanced offerings based on Phison’s PS50008-E8 controller and Toshiba’s 3D NAND memory. GALAX made the announcement at an event in China and did not disclose all the details about the new drives except the fact that they will come in M.2-2280 as well as PCIe AIC form-factors and will use a PCIe 3.0 x2 interface. Phison’s PS5008-E8 controller is compliant with the NVMe 1.2 specification, supports four NAND channels, a DDR3/DDR3L DRAM buffer, AES-256 encryption as well as Phison’s new error correction algorithm called StrongECC, however exact features on the GALAX model will be up to its product team. The controller is compatible with MLC and TLC NAND flash made using 15 nm and 16 nm process technologies as well as 3D NAND memory. Phison started to sample its PS5008-E8 controller with select customers in Q3 2016, so SSDs based on the chip are unlikely to hit the market this quickly (we expect Q2 onward). On the other hand, Toshiba’s 64-layer 3D NAND is not yet available in mass quantities, which is why Phison, GALAX and other suppliers of SSDs have time to polish off their products based on the PS5008-E8. Given the number of NAND flash channels supported by the Phison PS5008-E8 as well as its PCIe 3.0 x2 bus, SSDs using the controller will only target entry and mainstream PCs. On the other hand, GALAX’s partnership with Phison would enable the company to introduce more powerful SSDs based on the PS5007-E7 controller with Toshiba’s MLC NAND and PCIe 3.0 x4 bus aiming at the high end of the market. GALAX did not reveal when it expects to release its new SSDs featuring the PS5008-E8 chip, but given the state of Toshiba’s 3D NAND, it is unlikely that this is set to happen earlier than in mid-2017. Samsung, Micron/Crucial, and Toshiba are the only companies that matter AFAIK. How about Sandisk being partner with Toshiba in their foundry business ? I think WD just made the right move. I am surprised that they did not launch already a killer 4TB mechanical drive with lots of cache. I wish I could buy a big drive with SSD inside. Best of both worlds. Capacity and Speed. You forget Intel (the other half of IMFT), and as RaduR pointed out, Toshiba's NAND has been a joint venture between Toshiba and SanDisk/WDC since the very start.